The horse racing is one of the most exciting gambling games ever. It is also one of the oldest gambling games. People love to gamble on horses because of the excitement of horse racing. When the race began it’s impossible to hold your breath. If you bet on a horse you will feel like that you are riding that horse. It’s simple that horse race is so popular for gambling. Jackpot City has put a new dimension of horse racing by including Royal Derby mobile virtual horse racing game in their online casino. Now it is possible to enjoy the excitement of real horse racing and gambling from anywhere. This game is just not putting bet on any horse and hoping so that it wins. You need to be skilled to choose the best horse in the house. You have to consider the best horse for a particular race. Remember every race is distinct and you should choose a horse wisely. When the game start you will be shown the six horses ready for the race. You will also get the additional information of the race like the condition of the weather, the odds placed on each horses and the track condition. You can select additional information of a horse by clicking on that horse. This will show you the record of this horse in different races and in different conditions. The name and performance of the jockey will also become available to you. Check all the information available of the horses and the jockeys. Now, you have to choose the best horse for current condition analyzing the previous records. After choosing the horse you need to place bet on that horse. You can select any amount to bet. There are two betting options available. You can choose the bet type as “To Win” and you will get the payout odds placed for your selected horse only if your horse comes in first place. You can also select the bet type as “Each way”. Under this type you can post two bets. One if your horse finishes in first place and another if your horse finishes in either first or second place. After you have selected the horse and the bet click on the race button. The real fun begins now. You will see the animation of a mobile horse racing in which all the horse will begin their race. This will provide adrenalin pumping excitement for you. You will start to shout for your horse just like a real horse race. If your horse finishes in first place you will get the placed odds for your horse and in addition you will also get back your placed bet. You can race as many times you want and each race will be different and you will get the same excitement each time. While playing at the Jackpot City, you can be sure to win if you can select the horse wisely. The payout is the highest among all the online casinos and this ensures your winning. 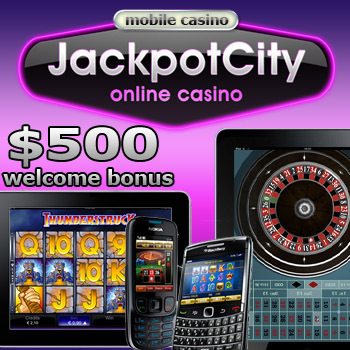 You can play with your mobile from anywhere after registering with Jackpot City. The registering process is quite easy and what more you will get 100% welcome bonus on your first recharge. While playing you will be amazed finding bonuses every now and then. Jackpot City is the perfect place for playing Royal Derby horse racing game for its wonderful playing environment provided to its user. Download the Royal Derby game from Jackpot City and start enjoying the exciting Royal Derby game and start racing with your favorite horse.